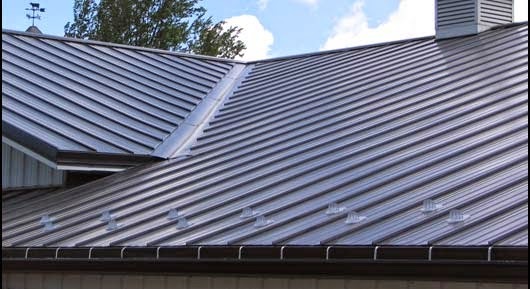 Metal roofing is a versatile roofing material that is durable, attractive and long-lasting. The average lifespan of a copper, aluminum, or steel is between 35 and 50 years! Metal roofing styles and colors vary widely. Choose aluminum shingles for a “classic” roof look, or opt for the modern look of steel sheets. Other benefits of metal roofing include a high resistance to mildew, mold, and other debris, as well as lower heating/cooling costs. And when installed correctly, a metal roof will reflect the sun away from your home, keeping your house cool and comfortable. When you shop around for that perfect roofing contractor, there are some obvious questions you want to ask before hiring any roofer. There are also things to consider that are specific to metal roofing installation and experience in that particular material is a must. Metal roofing is laid directly on top of the existing roof. Although this technique may be less labor-intensive than ripping out the old materials, the job must be done right. Spending a lot of money on a metal roof is a fantastic investment, but improper installation will cost you down the road. Make sure you hire a metal contractor with proven experience to avoid common installation pitfalls. • Take your time. Don’t let a roofer pressure you. Make the final decision regarding your home improvements on your own schedule. Thinking about a metal roof replacement? If you’re considering installing this increasingly popular material, contact Trudel and Sons Roofing for help. We have nearly three decades of experience installing and repairing Ontario roofs and can handle all your metal roofing needs with dedication & skill. Each of our metal roofs comes with an extensive warranty, and is designed to accent and protect your home for decades to come.